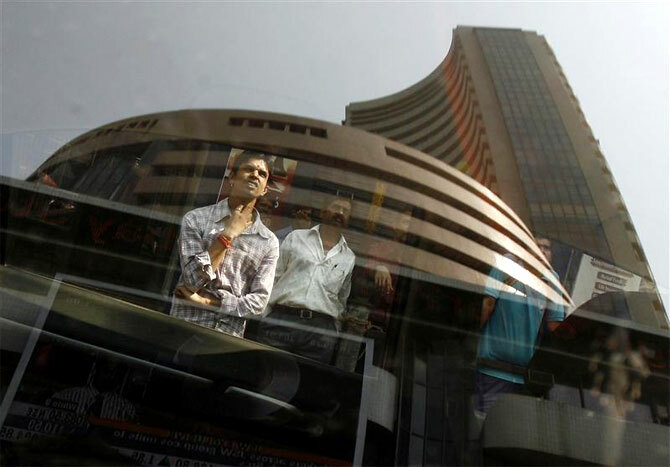 The S&P BSE Sensex ended the session at 25,342, up 3 points while the Nifty50 closed at 7,738 points. Markets ended the last day of the financial year on a lacklustre note as traders rolled their positions in the derivatives segment from March series to April series. The S&P BSE Sensex ended the session at 25,342, up 3 points while the Nifty50 closed at 7,738 points, up 3 points. The currency appreciated for the sixth consecutive day. At closing, the Indian rupee was trading at 66.25, stronger by 12 paise against the American currency amid increased foreign fund inflows. Meanwhile, foreign institutional investors remained buyers in equities with net purchases of Rs 1,442 crore on Wednesday, as per provisional stock exchange data. In the commodity space, oil slipped to $39/barrel on record U.S. stockpiles, concerns over China's economy and new data showed euro zone inflation remains non-existent despite the European Central Bank's redoubling its stimulus efforts. World stocks fell today with Asian equities ending mixed while European markets are trading under pressure amid a slide in oil prices and a stronger dollar. At 3:30 pm Indian Standard Time (IST), FTSE 100, DAX, and CAC40 were trading down between 0.5%-1% each. Barring Hero MotoCorp, shares of two-wheeler companies Bajaj Auto, Maruti Suzuki, Tata Motors skid nearly 1% ahead of their March sales numbers. Pharma shares recovered from recent losses post the observations of select companies by the USFDA and the recent ban by the government on combination drugs. Sun Pharma, Lupin gained between 0.1%-1.2% each. Dr Reddy's Laboratories Limited announced that it has entered into a licensing agreement with Japanese pharmaceutical company Eisai Co. excluding Japan and Asia, for Eisai's investigational anticancer agent E7777. The stock advanced nearly 1%. Drug firm Aurobindo Pharma has received final approval from the USFDA to manufacture and market pantoprazole sodium for injections, used for the treatment of gastroesophageal reflux disease, in the American market. The stock ended 1.3% up. FMCG majors also witnessed buying interest with ITC and Hindustan Unilever up 0.4%-0.8% each. Among other shares, shares of Natco Pharma gained over 3% on the Bombay Stock Exchange on plans to sell-off its non-core business. The company in a release said, the board of directors at its meeting held on March 30, 2016 approved the sale of Save Mart Pharmacy Stores located in USA which is non-core business. Shares of Mercator surged over 9% on the Bombay Stock EXchange after the company said it has received approval for divesting entire stake in its Singapore-based step down subsidiary. The company in a release to the exchange said that Mercator International Pte. Ltd has received approval from the Singapore Exchange (SGX) for divestment of the entire stake in Mercator Lines (Singapore) Ltd.
PNC Infratech on Thursday said it has bagged a Rs 1,155 crore contract for four-laning of a road project in Uttarakhand and Uttar Pradesh. The stock ended over 3.5%. State-owned MTNL on Thursday said it has received Rs 428.95 crore from government for surrendering spectrum in the 800 MHz band, used for providing CDMA mobile services in the country. The stock climbed 2%.